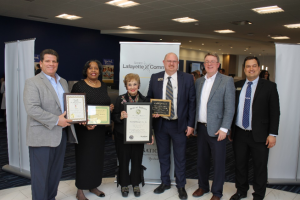 Neuhoff Media Lafayette received a distinguished honor by being named the March 2019 Small Business of the Month by Greater Lafayette Commerce. The Greater Lafayette Commerce Small Business of the Month/Year Program (SBOM) is designed to recognize the dedication, innovation and entrepreneurial spirit displayed by Greater Lafayette Small Businesses. The goal of the monthly award is to highlight a small business and give them extra marketing exposure to aid in growing their business. A reception was held at the brand new Old National Bank building in downtown Lafayette, March 27th. Vice President/General Manager of Neuhoff Media Lafayette, Chris Fleming, received Small Business of the Month awards on our behalf from Greater Lafayette Commerce, the City of Lafayette, The State of Indiana and the City of West Lafayette.